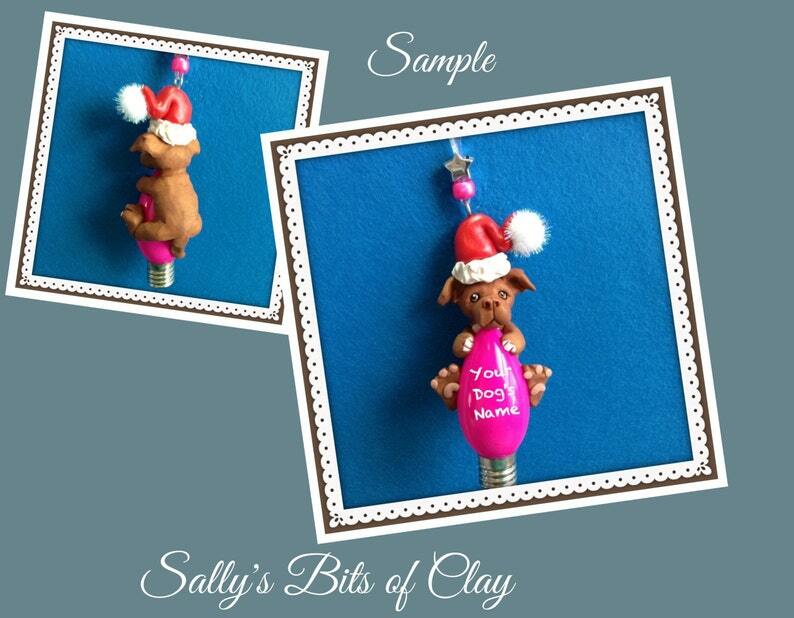 Shown is the Red Pit Bull Terrier with natural ears Santa Dog Christmas Light Bulb Ornament. YOU CAN CHOOSE NATURAL EARS OR CROPPED EARS. The original dog is hand sculpted by me with polymer clay. Some details are hand painted. It is attached to the Christmas Bulb. It is the larger outdoor sized bulb. Total Ornament measures APPROXIMATELY 4 inches. Includes personalization with Dog's name. I would highly recommend Sally’s work! She did an amazing job customizing my ornament to look exactly like the pictures I sent her of my sister’s dog. The ornament looks incredible!